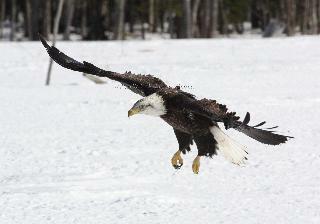 The American Bald Eagle has been threatened and endangered to the edge of extinction. 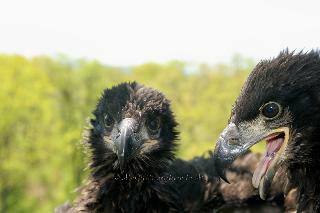 Once a common sight throughout this nation, these powerful raptors’ numbers plummeted from nearly 400,000 in the 18th century to less than 10,000 nesting pair during the 1950’s. <?xml:namespace prefix = o ns = "urn:schemas-microsoft-com:office:office" /> Human interference and ignorance brought those numbers to an even more drastic decline. 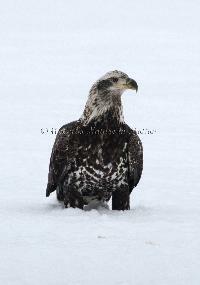 Within the continental United States less than 500 nesting pair existed by the 1960’s. This decline was brought about by a combination of events. Destruction of habitat, mass shootings and widespread use of pesticides all played their part in this catastrophic result. The use of DDT on crops caused thinning of the egg shells which consequently broke during incubation. 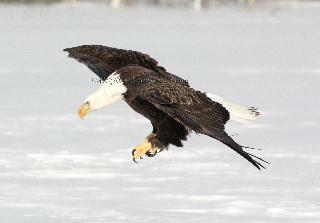 Even with the delisting of the bald eagle from the threatened and endangered list there is still the chance of confined threats such as loss of habitat or the continued threat of contaminants. The U.S. 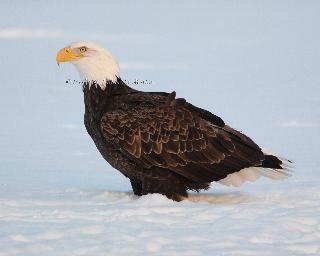 Fish & Wildlife Service has determined that none of the existing or potential threats are likely to cause the bald eagle to become in danger of extinction within the foreseeable future. With the help of a research team from Clemson University of South Carolina, Federal and State wildlife agencies are monitoring the levels of toxins and containments in the Great Lakes Ecosystem. The research team will work with the DNR who will use aerial surveillance to locate active nest starting in the southern end of <?xml:namespace prefix = st1 ns = "urn:schemas-microsoft-com:office:smarttags" />Michigan. The DNR will do a township by township grid to pinpoint each nest. 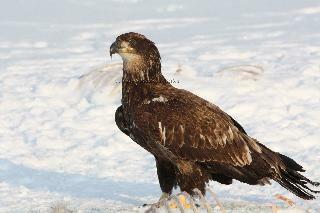 The DNR will also at the same time give a report as to the color of the eaglets in the nest. If they are grayish brown they are 4-5 weeks old. 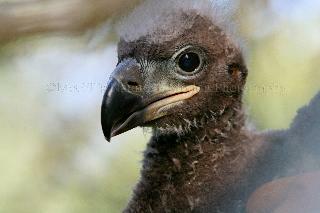 If the eaglets are black they are 6-7 weeks old. If the eaglets are any older they are too close to fledging to try to band them.<?xml:namespace prefix = o ns = "urn:schemas-microsoft-com:office:office" /> The research team will study the flight report to figure their plan of action mapping out how they will be able to access the nest. Will they need to cross any lakes, rivers or swamps? They will also need to acquire permission to cross any private land. This can create a problem. Once again even though the Bald Eagle has been delisted from the threatened & endangered list – there is still the possibility of threats such as loss of habitat or illegal use of contaminants.<?xml:namespace prefix = o ns = "urn:schemas-microsoft-com:office:office" /> The Endangered Species Act requires monitoring of the Bald Eagle for five to twenty years after its delisting. If at that time it is again necessary the U.S. 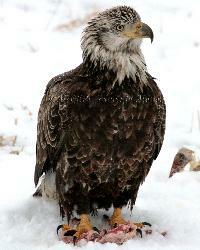 Fish & Wildlife Service with relisted the Bald Eagle as threatened or endangered. 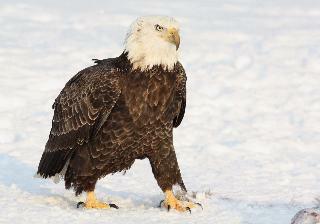 But for now the Bald Eagle is making a spectacular comeback. We now have nearly 10,000 nesting pair in the continental <?xml:namespace prefix = st1 ns = "urn:schemas-microsoft-com:office:smarttags" />United States. 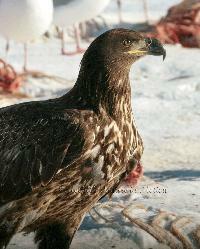 And with continued protection under the Bald & Golden Eagle Act- the Migratory Bird Treaty Act and monitoring by the U. S. Fish & Wildlife Service with the help of research teams, hopefully theses numbers will continue to grow.